Here is a simple but healthy recipe to serve as prasadham / offering to Lord Krishna on the special occasion of Krishna Jayanthi. 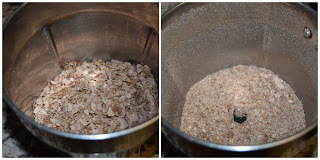 In this recipe I have used red rice flakes to increase the nutritive content of the dish; instead, you can also use white rice flakes / poha (Hindi) / Aval (Tamil). 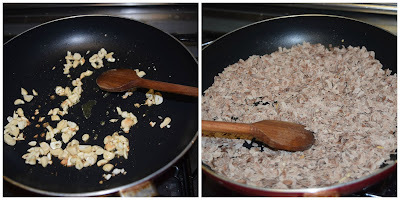 Heat ghee in a heavy bottom pan; add cashews and fry till colour changes to golden brown. Keep aside. In the same pan, fry rice flakes till you get a nice aroma for about 3 to 5 minutes in medium flame. Keep aside. Once it is cooled, grind it to a coarse powder. 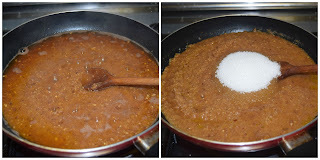 In a pan, add 3 cups of water and kesari colour; allow to boil. 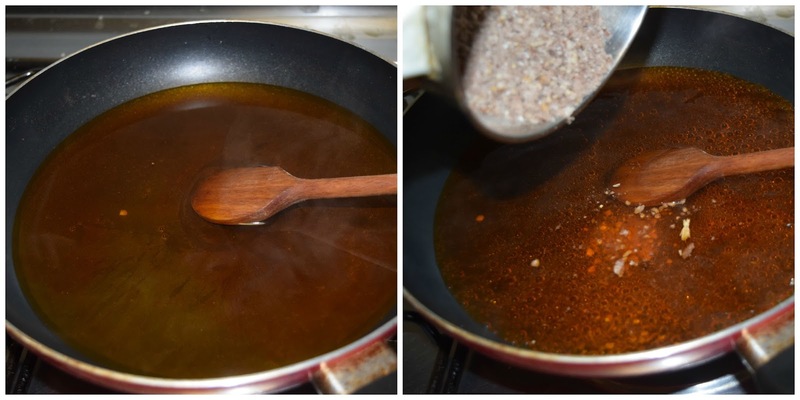 Add powdered rice flakes to the water and simultaneously stir to avoid lumps (do this in medium flame) and cook till the water is absorbed. Add sugar and stir well till it melts. Add ghee, cardamom powder and nuts to the mixture and keep stirring till it leaves the sides of the pan. 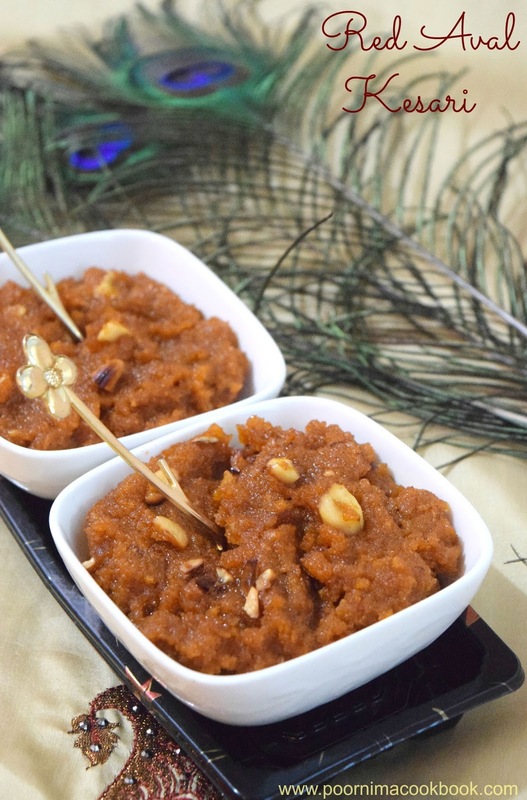 Adjust the sugar and ghee level to suit your taste! Amount of water will differ according to the variety and thickness of the rice flakes. This look super easy poornima.Wonderful clicks. Thanks Poornima, I did try this recipe and it came out good. I've linked your page under the post. It is simply facts in order to found almost everywhere, it really is wonderful article My spouse and i go here. to say actually My spouse and i seemed to be incredibly fascinated for this web page, My spouse and i can't believable how it really is authored it My spouse and i take pleasure in this writer, thank you very much. Hi Kaviya, I have not tried without grinding aval. 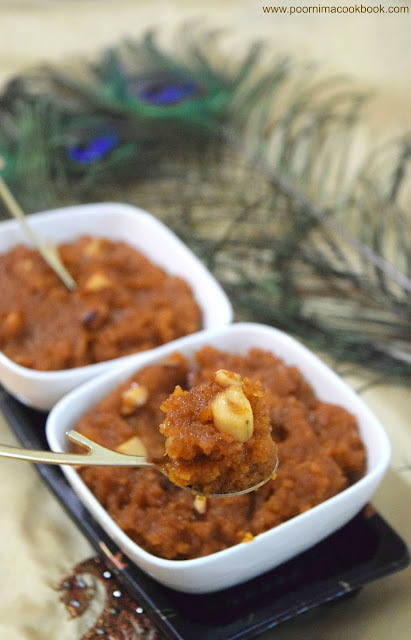 Kesari texture won't come ,if you don't aval.